We are available 7 AM to 11 PM, Monday through Friday, with weekend hours available based on our customers needs. All shipping and receiving is done by appointment. Our material handling equipment includes electric, propane and high rise forklifts, and turret trucks in our racked storage area. Our equipment can handle most any product but not limited to palletized, slip sheet, carpet and rolled paper. We can handle most any product up to 5,000 pounds, including but not limited to: slip-sheeting, repalletizing, pick and pack, sorting, relabeling and repackaging. Ask us, we can probably do it. We offer consignment warehousing for your raw materials, finished goods or packaging supplies. We work with our customers to manage their inventories. 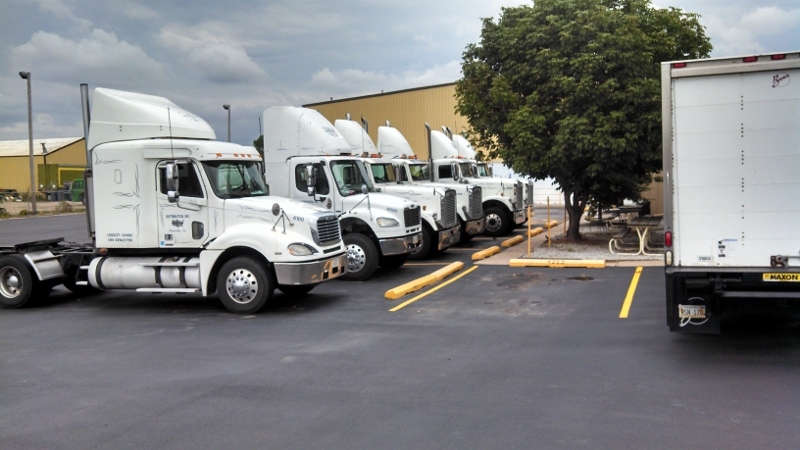 We have our own fleet of late model power units and trailers for transportation of your material, from one pallet to a full truck, locally or long distance. 22 plus dock doors to service your needs. One ground level roll up door for outside loading/unloading. Our trailers are delivered clean, dry and in good shape. We have over 40 trailers including dry van, lift gate, and flat bed. Services that we offer include pickup and delivery, transloading, shagging, trailer rental, just to name a few.